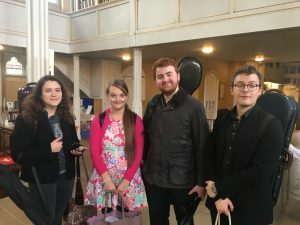 At lunchtime on Tuesday 5th June we were delighted to welcome and hear the Fitzroy Quartet performing a Beethoven String Quartet in D major, op 18 no 3, (1801) in St Mary & St Giles church. This concert was part of StonyLive! I loved hearing them rehearse when the church is empty as it seems to resonate more – an uplifting sound. This was followed by another gem: Mozart’s Clarinet Quintet in A major, K. 581 (1789) with the quartet joined by our Ben Westlake. You could see the players communicating with smiles as they played. Standing ovation at the end and an audience of about 55 and retiring donations in aid of the Greater Access Project – disabled access. 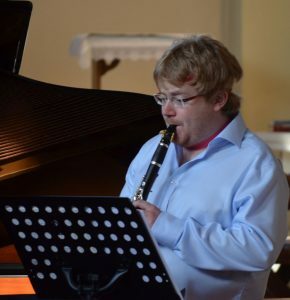 We’d love Ben to come and play the Mozart again when he’s got a Basset Clarinet! As a player of the clarinet myself, the word that came to me after just the first few notes was that Ben’s clarinet sound was ‘fluid’! Fabulous skills of the players, of Wolfgang and of the instrument makers!